Have you ever wondered why your car gets a room of its own while you can’t find a quiet corner where you can put up your feet? When you convert a garage into a man cave, no longer will you need to be jealous of your vehicle’s private quarters. Turning a garage into a hangout can be as simple as plugging in a TV and plunking down a comfortable chair. Or, you can go all out and convert the space into a proper room. Before you start a major overhaul, however, be sure you’re OK with a permanent change. If you ever want to park your car in the garage again, make changes that will allow you to do that. Should You Replace the Garage Door? If you want to remove all traces of the garage, you can replace the door with a wall or a smaller door. But, it’s cool to have a room with a big door. Anytime you want an indoor/outdoor room, just raise the door. Consider upgrading a plain-looking garage door with a more stylish option. Declutter: Get rid of the things you don’t want. Organize what remains. You can store things elsewhere, or get smarter about using the vertical and overhead space in the garage. Clean everything. Insulation: If your garage is hot in summer and cold in winter, you won’t want to spend time in it. A detached garage may need insulation everywhere: walls, ceiling, floor and doors. If it’s attached, add insulation where needed, especially to the garage door. Consider replacing the door with an insulated model. Flooring: Garage floors are practical and easy to clean. If you’re happy with the look of the floor, don’t change it. You can make it warmer with pads and carpeting. More permanent changes include raising the floor and installing floor boards. Lights and Electricals: You’ll most likely want to improve the garage lighting. For an industrial-style lighting scheme, hang pendant lights in the garage. Floor lamps are also a good option. If the garage’s electricals are inadequate or you want a recessed lighting, hire an electrician to help out. Security: Make sure your garage is secure. Upgrade the locks and doors if you need to. Consider using a smart garage door opener. These will allow you to monitor the door from afar. If someone opens the door while you’re away, you’ll get a notification. The Fun Stuff: To make your garage comfortable, you’ll need to decorate and furnish it. The only requirement is to fill it with things you love. Since this is destined to be a spot where you go to relax and unwind, furnish your room accordingly. 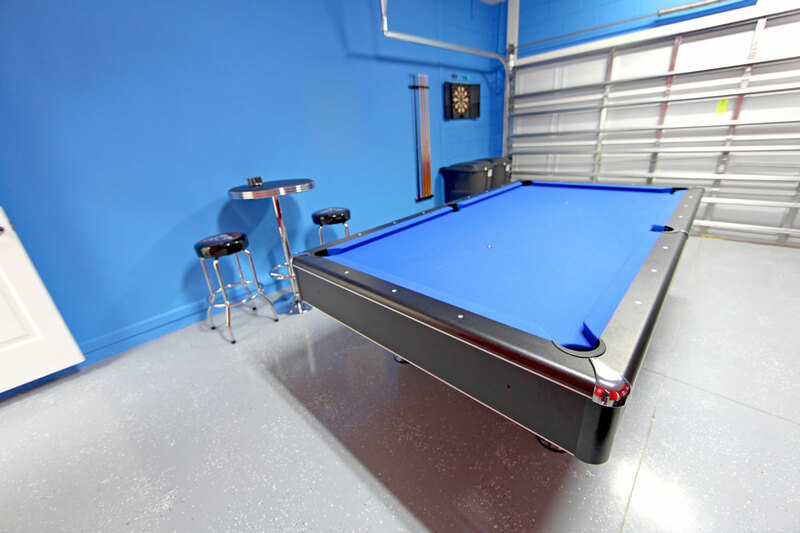 You can make the garage look like a sports bar, a reading room or a hobby area. Your interests will set the tone! Need a new door to perfect your man cave? Contact Ponderosa Garage Door & Repairs for help.